Start dehydrating pears when they are in season so you and your family can enjoy them all year long! Pears contain vitamin A, and vitamin K, followed by vitamin C, Folate, and Choline. 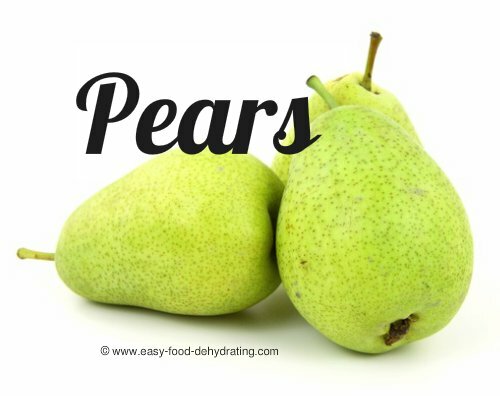 In the mineral category, pears rank high in Potassium, followed by Phosphorus, Calcium, Magnesium, and Fluoride. Pears also contain Omega-6 fatty acids, and are a great source of carbohydrates and have a good amount of dietary fiber too! Dehydrated pears are also tasty as snacks, cookies, fritters, breads, and granola. Also great in: fruit rolls! Juicy pears are also 'stars' in my morning smoothies. Wash one whole pear, cut off its top and slice to remove the center core; add a banana, and 1 cup of Silk-brand Light Vanilla Soy milk. Put all in the blender – blend until smooth – and enjoy! Dehydrating Pears the Easy Way! Fresh pears need to be pre-treated, so place the pears in a bowl and spray liberally with lemon juice TIP: Use a pump-top from a new unused spray bottle, pick one that fits your lemon juice bottle, look for one that has a long enough plastic tube that will reach to the bottom of your lemon juice bottle. If you decided to simply cut your pears into halves or quarters, place them on your food dehydrator trays with the cut-side up to prevent drips on the lower trays! Turn on your dehydrator and set the temperature between 125°F and 135°F (or per your food dehydrator's instructions). Drying time for dehydrated pears: between 6-16 hours and they will feel pliable when dried. TIP: It's always best for dehydrating pears or other fruits at peak ripeness. 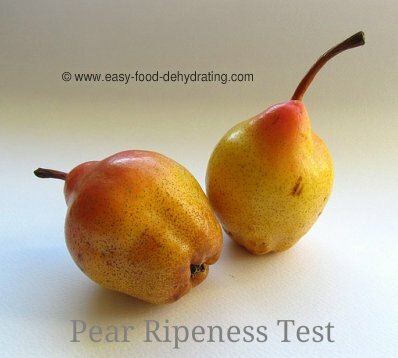 The usual way to test for ripeness is simply pressing on the fruits' skin – if you leave a slight indentation with your thumb, then the fruit is ripe. Don't go puncturing the skin, that way it'll go brown and you may attract those pesky fruit flies and we don't want that! To hasten the ripening process, put your fruit inside a brown paper bag, like one of those used for lunch bags. (If your grocery store still uses those small brown paper bags at the checkout counter, save those ... we do!) To speed up the process even more, leave a piece of fully ripened fruit in the brown paper bag, and the gas that it emits will help ripen the newly-added fruit!